Creating a clean and beautiful environment around your home or business is important. The way you and your guests feel about your surroundings is influenced largely by landscaping. Create-A-Curb, Inc. offers an innovative approach to landscape borders that brings a higher level of detail and beauty to your landscape design. Clean and creative lines are important to the overall layout of your landscaping. Create-A-Curb, Inc.'s concrete borders are the most durable, cost-effective, and attractive borders you can find. 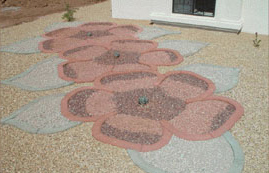 Our borders mold and bend to the unique shapes that best suit your landscaping ideas. No border can give such a clean and professional look. Concrete curbing is more durable than brick and comes in many different styles, colors, and textures. Create-A-Curb, Inc. is an extruded curb company; we have been installing concrete curbs for landscaping and parking lots since 1982. The process of our extruded concrete curbing is done by an electric driven machine for landscape and gasoline powered machine for parking lot curbs and heavy duty curbs that are designed to handle more abuse. The curbing mix is compacted through the use of a machine with a mechanically driven ram into a slip-form for extrusion into final structural design of the curbing border. 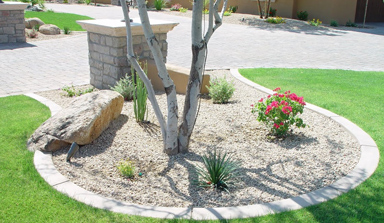 Create-A-Curb, Inc. is licensed throughout the State of Arizona, The Registrar of Contractors.